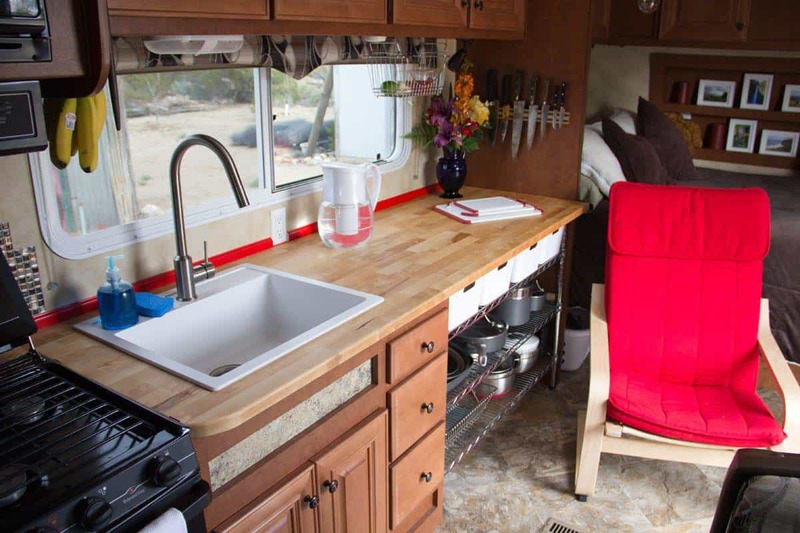 I love my little Arctic Fox RV but one of the things that I REALLY didn’t love about it was the kitchen area. 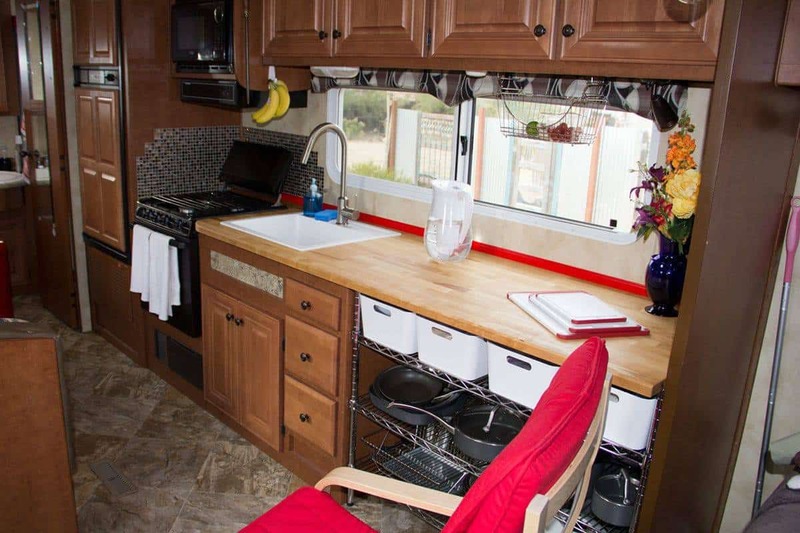 With very little counter space, cooking was often a challenge. The butcher block countertop, the sink, and the faucet all came from Ikea. 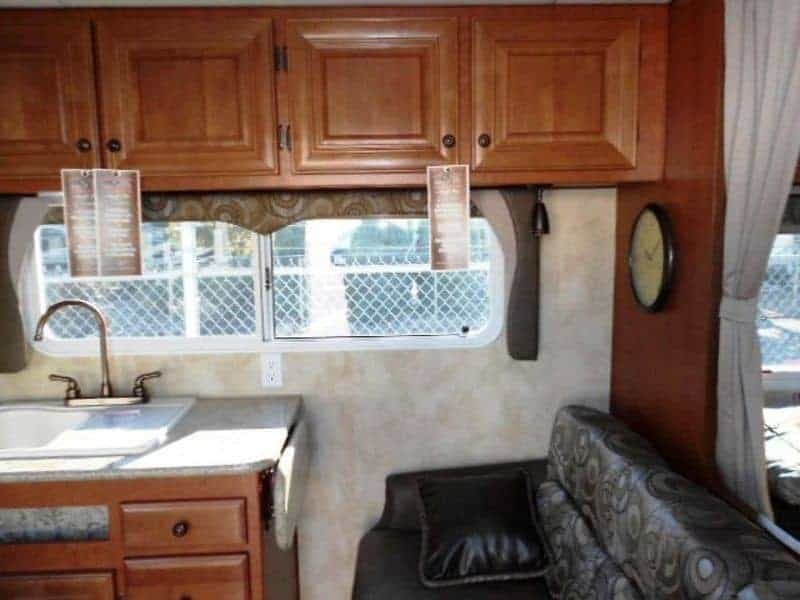 I didn’t like the RV products that were available (They were expensive but felt cheap.) and Home Depot and Lowes didn’t have sinks that would fit in the base cabinet. My cabinetry skills are sadly lacking so I wasn’t about to try to build new cabinets. That space below the sink was a recessed spice shelf but I had to remove it since the new sink needed just a little extra room. All in all, I added an additional 42″ of counter space. The wire shelving (42″x21″) just squeezed into the space so it’s not going to move at all. The white storage bins hold dry goods and all my pots and pans finally fit into 1 place. I’m not in love with the fake tile around the stove but the original wallpaper border just didn’t work for me and real tile wasn’t an option. I love my new kitchen! What do you think? Awesome renovation. May I suggest some form of netting in front of the pot/pans – to keep them in place will moving? Thanks Glenn! I’d already thought of that – just hadn’t gotten to it yet. 🙂 A bungee cord or 2 would work also. You did an excellent job. Looks homie. I would sit on your floor any time. Have a safe trip wherever you might be. Remember we are always here for you and sis. Hillary, I like the kitchen renovation! This was a good addition to the blog entries as it gets so boring looking at all the beautiful countryside you experience! ? It is pretty neat that Ikea had the sink and counter, I never would have thought of looking there! I hope to see this home in person soon. Lol, only kidding! I look at every landscape! ? Totally awesome remodel. Go girl! I’m going to be remodeling my AF trailer to accommodate my traveling companion, a 90+ Aussiedoodle, and me. 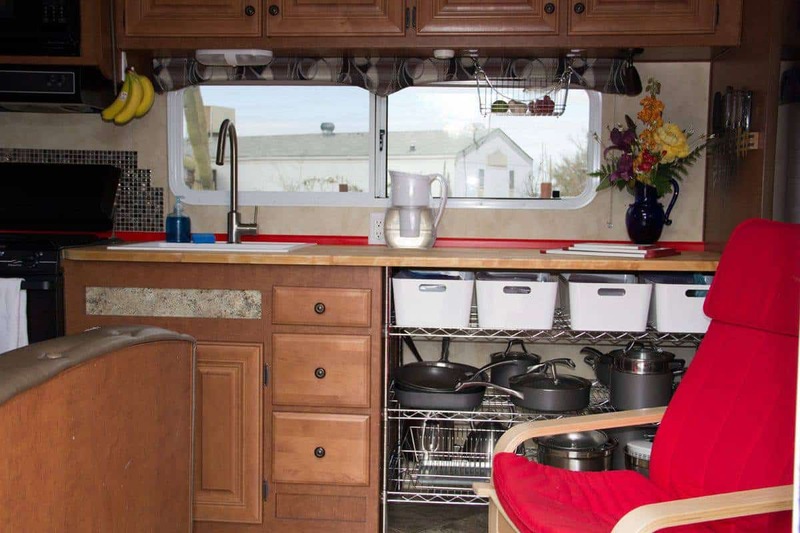 I would like to change out the kitchen sink as well. To save some head banging could you put down what size you bought from Ikea? 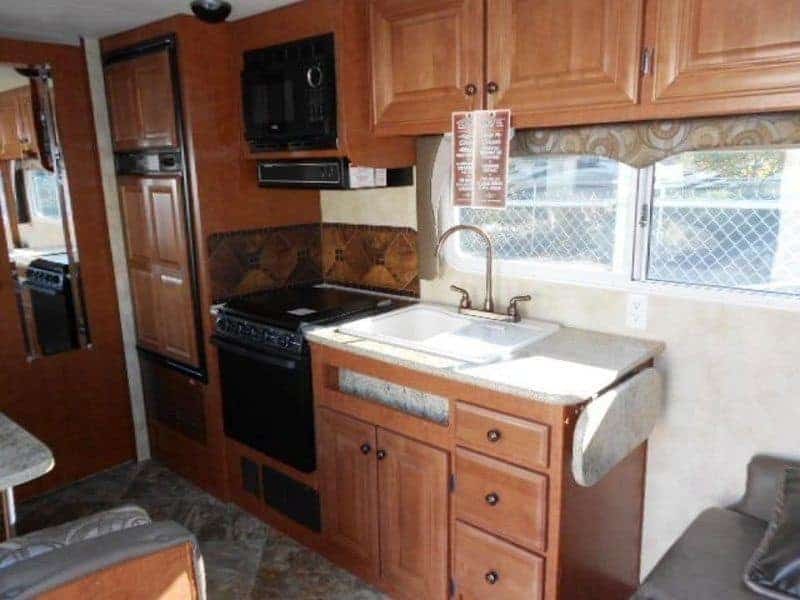 Please share some pictures of your remodel! I’m always curious to see what others do.